The following families are grouped together, but exact relationship between them has not been established. and Magonsaete (centred around Shropshire).
. [PEND061] Cnebba m. ? . . [PEND071] Cynewald m. ?
. . . [PEND081] Cridda of Mercia m. ? . . . . [PEND091] Pybba of Mercia m. ?
. . . . . [PEND101] Cenwalh m. ? . . . . . . [PEND111] Cundwalh m. ?
. . . . . . . [PEND121] Centwine m. ? . . . . . . . . [PEND131] Cynreow m. ?
. . . . . . . . . [PEND141] Bassa m. ? . . . . . . . . . . [PEND151] Cuthberht m. ? [PEND081] Cridda founded Mercia, ruled Mercia and Lindsey (586-93), and died 593. [PEND091] Pybba ruled Mercia (c.593-606). He either died or was deposed 606. [PEND102] --- (sister of King Penda of Mercia, i.e. daughter of Pybba) married (c.632) [CYNA201] King Cadwallon ap Cadfan (see GWYNEDD KINGDOM (1)). [PEND101] Cenwalh (son of Pybba). [PEND111] Cundwalh (son of Cenwalh). [PEND121] Centwine (son of Cundwalh). [PEND131] Cynreow (son of Centwine). [PEND141] Bassa (son of Cynreow). [PEND151] Cuthberht (son of Bassa). Cynefrith (possibly daughter of Cuthberht, see Mike Ashley's "British Kings and Queens") married Wiglaf, a Mercian Ealdorman who was later King of Mercia (827-29 & 830-9). 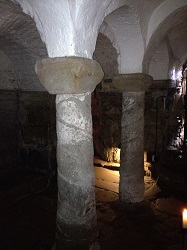 King Wiglaf appears to have been involved in alterations to the crypt below the Mercian church at Repton (built c.675). Florence of Worcester recorded that Saint Wystan was buried in the mausoleum of his grandfather, Wiglaf. [PEND163] Coenwulf (son of Cuthberht), King of Mercia (796-821), King of Kent (807-21), married Aelthryth. [PEND173] Princess Edburga (daughter of Coenwulf), married [MUCE251] Ealdorman Aethelred Mucel (see GAINI). [MERW321] Earl Edwin of Mercia m. ? [MERW321] Edwin, Earl of Mercia, was said to be descended from King Alfred. [MERW333] Ealdgyth (possibly daughter of Edwin) married 1. [SAXN331] Sifgeferth; then 2. [WESK351] King Edmund ironside, as Edmund is more likely to have married a daughter of an Earl, (see ANGLO-SAXON KINGS). [MERW334] Aethelfleda (daughter of Earl Edwin of Mercia) married [OWAI341] Gronwy ab Einion who died c.980 (see SEISYLLWG (2)).
. [SEMC291] Ealdorman Aelfstan of South East Mercia m. ? [SEMC291] Aelfstan, Ealdorman of South East Mercia, see below for further details. Athelstan half-king, Ealdorman of East Anglia (932-56), married Aelfwyn (who held land in Hunts). Aethelwald I, Ealdorman of Kent, etc. Eadric, Ealdorman of Central Wessex (929-49). The fact that four of his sons held important ealdorman [= sub-king] positions (spanning several Anglo Saxon reigns), suggests Aethelfrith could have descended directly from the royal house, but there is inadequate information. [SEMC291] Aelfstan (possibly eldest son of Aethelfrith), Ealdorman of South East Mercia. He died c.934. [SEMC302] --- (daughter of Aelfstan) possibly married [MERC311] Aelfwine ([born c.930-34], see MERCIA EARLDOM (2) below. [MERC301] Ealdorman Ealhhelm of Central Mercia m. ? [MERC301] Ealhhelm, said to be closely related to the Anglo-Saxon royal house, Ealdorman of Central Mercia (c.940-51). [MERC311] Aelfwine [born c.935-40], Ealdorman (mentioned in the "Peterborough Chronicle of Hugh Candidus"), Discthegn [=table steward] of Berkshire. He married [SEMC302] --- (said to be daughter of Ealdorman Aelfstan, see SOUTH EAST MERCIA above). [MERC321] Leofwine of Mercia ([born c.960], son of Aelfwine in the only known reference to his parentage) was Ealdorman [sub-king] of Hwicce (994) and of Mercia. He married Alwara (daughter [or perhaps only god-daughter] of Aethelstan Manesson, who was son of Mann), and died c.1023. Godgifu, worthy of perpetual renown, was famous for her great goodness, and built the abbey at Coventry, and incomparably endowed it with gold and silver. 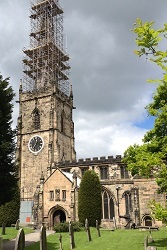 She also built the church of Stow, below the ridge on which Lincoln now stands, and many other churches. But the incident which made her famous, riding naked through the streets of Coventry, was first recounted by Roger of Wendover c.1220. Leofric was Earl of Chester (1018), then Earl of Mercia (1023-57), and died at Bromleage (31st August 1057). The "Domesday Book" (1086) records that Countess Godgifu had held land in Leicestershire and Warwickshire. Godiva died at Coventry (10th September 1067). [MERC341] Aelfgar (born c.1002, son of Leofric) married 1. (c.1025-30) [SAXN342] Aelfgifu (born c.990, daughter of [SAXN331] Sigeferth the Saxon, see SAXONS below); then 2. (1058) --- of Gwynedd (daughter of Gruffydd ap Llywellyn, see GWYNEDD KINGDOM (2)). Aelfgar was Earl of East Anglia (1051-52 & 1053-57), then Earl of Mercia (1057-58). He was banished from England (1058), and died c.1062-65. Michael Swanton gives as Aelfgar's wife: Aelfgifu (daughter of Thegn Siferth of the Seven Boroughs by Ealdgyth, who was daughter of Aelfthryth, who was son of Wulfrun the Mercian Lady). Eadwine/Edwin (born 1028, son of Aelfgar & Aelfgifu), Earl of Mercia (1065-66), and was killed "treacherously by his own men" (1071).
. [MERT321] Aelfthryth of Mercia m. ? [MERT311] Wulfsige the black married Wulfrun of Tamworth ([born c.915], a noblewoman of Mercia, and possibly daughter of Thegn Wulfric Cufing of Mercia, by Lady Aelfwyn of Mercia [born c.888]). Wulfrun was captured at Tamworth in a raid by the Danes (943). [MERT332] Ealdgyth ([born c.980], daughter of Aelfthryth, and niece of Wulfric Spot, Thegn of Mercia) married [SAXN332] Morcar (son of Earngrim, see SAXONS below). [SAXN321] Earngrim the Saxon m. ? Sigeferth [Siferth] the Saxon (son of Earngrim the Saxon), thegn of the Seven Boroughs, married Ealdgyth (of unknown origin, but see Ealdgyth, mentioned under MERCIA EARLDOM (2) above). Sigeferth was treacherously murdered (1015) at Oxford, by ealdorman Eadric Streona, together with his brother Morcar. King Aethelred II the unready then seized all their property, and Sigeferth's widow Ealdgyth was sent to Malmesbury. Shortly afterwards, Aetheling Edmund travelled to Malmesbury and took Ealdgyth against the king's will. Ealdgyth later married 2. (1015) King Edmund ironside (see ANGLO-SAXON KINGS). [SAXN332] Morcaer [Morcar] the Saxon (son of Earngrim the Saxon) married [MERT332] Ealdgyth (see MERCIA THEGNS above). Morcar together his brother Sigeferth (both the most senior thegns in the Seven Boroughs) were murdered at Oxford (1015) by ealdorman Eadric Streona, a staunch supporter of King Cnut. This appears to be the only reference to the Seven Boroughs, in the Anglo-Saxon Chronicles (Peterborough manuscript). Apart from this being possibly a slip at the time, one historian has suggested that the 6th and 7th Boroughs could have been Torksey (5 miles upstream from Gainsborough) and York. [SAXN342] Aelfgifu (born c.990, daughter of Morcar) married [MERC341] Earl Aelfgar (see MERCIA EARLDOM (2) above).